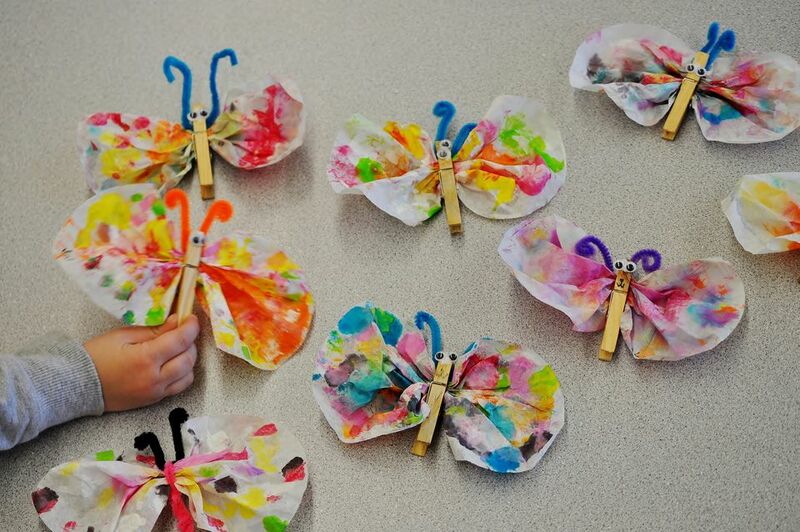 Find out how you can craft colorful butterflies using coffee filters, food coloring, and clothespins. You can hang these in a window, from a tree, or even attach a magnet to the back. Start out by dampening the coffee filter with water so it lays flat. Color the coffee filter using watercolor paints or food coloring. Set it aside to dry. Paint the clothespin black. Once the paint is dry, glue on two wiggles eyes. Cut a piece of chenille stem about 2-inches long, fold it in half, and glue it on just above the eyes to be the antenna. When the coffee filter is dry, pinch them in the middle. Clip the middle of the coffee filter into the clothespin to be the wings. Spread the wings out and you are done. Finally, to finish your butterfly, glue a magnet to the back. If you prefer, you can add a ribbon loop instead of a magnet and hang it up like an ornament. A variation shared by Shannon from NC: Instead of paint, have kids color coffee filters with washable markers. Mist the coffee filter with water causing the colors to run together, let dry. Construct the butterfly as suggested above.